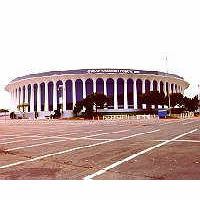 The Forum (known for a 15-year period as the Great Western Forum) is an indoor arena, in Inglewood, California, a suburb of Los Angeles. From 2000 to 2010, it was owned by the Faithful Central Bible Church, which occasionally used it for church services, while also leasing the building for sporting events, concerts and other events. Along with Madison Square Garden, it was one of the most well-known indoor sports venues in the US, during its time operating as a major venue. The Forum achieved its greatest fame as the home of the Los Angeles Lakers, of the NBA and of the Los Angeles Kings, of the NHL from 1967–1999, when the teams moved to Staples Center. The building was also the home of the Los Angeles Sparks, of the WNBA, from 1997, until they too moved to Staples Center in 2001. The Forum was the site of the 1972 and 1983 NBA All-Star Games, the 1981 NHL All-Star Game, Basketball at the 1984 Summer Olympics and hosted the Big West Conference men’s basketball tournament from 1983–1988 and also the 1989 Pacific-10 Conference men’s basketball tournament. In December 2010, Madison Square Garden, Inc. was reported to be finalizing a deal to purchase the Forum. A possible refurbishment project for the venue is in the works. The Forum is located at 3900 West Manchester Boulevard, across 90th Street (re-dedicated as Pincay Drive in December 2003) and to the north of the Hollywood Park racetrack and casino, about three miles east of Los Angeles International Airport. It is a prominent feature on the landing approach to the airport from the east.